According to Steven Foster in 101 Medicinal Herbs, " Aloe gel relieves pain and inflammation and increases blood supply to injuries by dilating capillaries. It promotes recovery by increasing tensile strength at the wound and healing activity in the space between the cells." 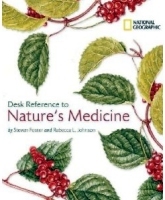 This informative book brings up to date information on the history, use and recommended dosages of 101 Medicinal Herbs. Mr. Foster is a highly respected herbalist and accomplished botanical photographer. This book utilizes both of his talents with current information on how the herb should or should not be used and color photographs for proper identification of the plant.